American Association of Law Libraries recently held their Western Pacific Chapter Annual Meeting (AALL Westpac) in San Francisco on Oct. 14-16 . Nolo was lucky enough to help kick off the event and host an excursion to its facilities in nearby Berkeley. 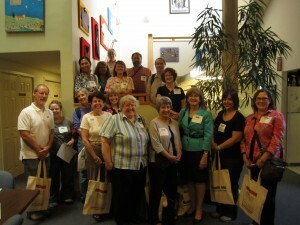 20 law librarians participated in touring Nolo’s offices and warehouse, and numerous law schools, county law libraries and law firms were represented on their behalf. Several Nolo editors were on hand to show the friendly faces of Nolo and to provide industry insight during information sessions. The tour ended with a shopping spree in the bookstore, where the librarians could browse through Nolo’s many titles and products. Nolo was extremely grateful for the opportunity to meet loyal customers and discuss current trends and issues. We received thoughtful feedback from the behind-the-scenes event and once again, Nolo extends a big “Thank you!” to the visiting librarians.